It is very important for pregnant women with asthma to be closely monitored. Perhaps you have asthma for many years or you were recently diagnosed with it. Having desired pregnancy in combination with this diagnosis can make you very worried. If this can reassure you, the statistics shows that millions of people suffer from asthma worldwide. Epidemiological analysis in the US show that 3.7 to 8.4% of pregnant women on age of 18 to 44 years suffer from asthma. Basically, asthma puts pregnant women in a difficult position, especially in the presence of other complications associated with pregnancy itself. According to studies, in more severe forms of the disease, the condition of the women during pregnancy gets worse, but in lighter forms, it may remain unchanged or even improved. 1. To take regular medicines that prescriped by the doctor, even if you feel well. Fortunately, most of antiasthmatic drugs are not harmful and can be used during pregnancy. Inhalers are preferable to the medication taken in tablet form. 2. To monitor your condition and in case of need to act as directed by your doctor’s treatment plan. 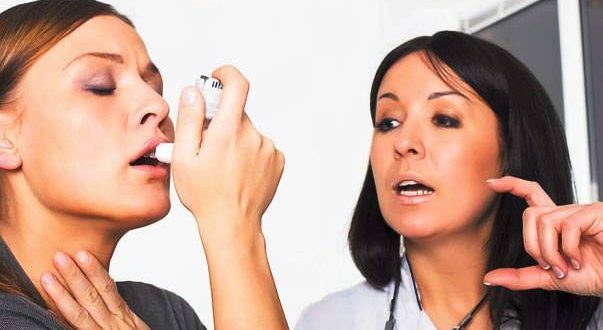 For daily treatment, in particular for asthma attacks, your doctor should write you a detailed treatment plan. In the treatment plan must be described actions you should perform depending on your condition. Study it carefully and even memorize it. Animal fur – better don’t allow animals at home and don’t take pets. Do not go to homes, where there are such animals. The danger comes from dead skin cells of these animals that contain secretions from their glands, not by the fur of animals itself. Particles of these cells carry into the air and inhaled by humans and these are dangerous allergens. Smoke – do not allow to smoke around you. This will hurt both you and your baby. Dust mites – wash bedding more often at least 60 degrees and allow it to dry under the sun. Feather pillows are contraindicated. Dust cleaning – possibly don’t use vacuum cleanr and don’t clean dust. Don’t use strong cleaners. Smoke from stoves and fireplaces – avoid rooms that are heated by fire or similar ways. Strong smells – do not use highly perfumed soaps or shampoos. Mold and moisture – Control the humidity in the bathroom and other wet areas. Dad weather outside – when the weather is wet or cold, avoid going out or, if necessary, breathe through a cloth or scarf. Severe stress and emotions – loud laughter, yelling or crying can also cause shortness of breath. Virus and influenza – it is a big risk for the condition of the pregnant asthmatic and therefore at the lowest symptoms, seek medical help. 4. To know the disease and its symptoms well and keep constant contact with your doctor during pregnancy, and after that at least 2-3 times a year. In short what is bronchial asthma: the air you breathe passes through millions of ever-decreasing size airways /bronchus/ and reaches the microscopic sacs called teethridges. There the exchange of oxygen and carbon dioxide happens. When asthma is under control, bronchus are passable and the air is inhaled and exhaled without effort. In patients with asthma airways react with some of the constituents of the air and inflame. They swell, become narrower and it’s more difficult for the air to pass through them. An asmatic attack happens, during which fewer air enters and exits the lungs. The person starts coughing, lungs blare, he feels tightness in the chest. The most common causes of asthma attacks are allergens and viral infections of the respiratory tract. It is important to know that when pregnant with asthma, there is a greater risk of developing some of gestational toxicosis – high blood pressure, swelling and albumin in urine. There is a risk of fetal prematurity. It is believed that the mechanisms which affect adversely the baby is shortage of oxygen in the body of the mother. It is very important for pregnant women with asthma to be closely monitored. There is no evidence that maternal asthma can lead to congenital malformations in the baby, but there is a risk of premature birth, so pregnant women should be under constant surveillance.